Ukraine has named 14 Russian singers and actors, including French-born Gerard Depardieu, whose work will be banned from TV, radio and cinemas. Mr Depardieu, who received a Russian passport in 2013, was last month banned from entering Ukraine for five years. 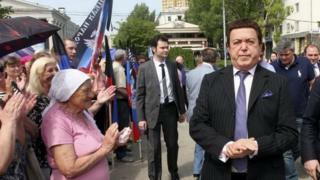 Mr Kobzon has already been targeted by EU sanctions for supporting Russia's actions in Ukraine.